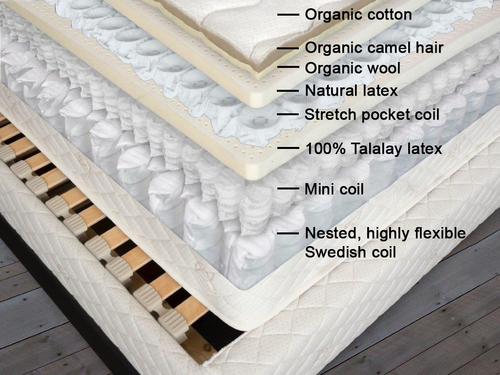 The Swedish pocket coils in the base layer of the Sonata are nested for maximun coil density. The main advantage of pocket coils is the independent response of each coil. This conforms to body contours for pressure relief and lumbar support. They also do not transfer motion from one part of the mattress to another, so one sleeper's movements do not disturb the other. On top of the base coils in the Triple Coil Model is a layer of minicoils (1500 in Queen size). These shorter and narrower coils further refine the conformity of the base coils. The mincoils are topped by a 1" layer of Talalay latex. The uppermost coil level in the Sonata is a layer of Swedish stretch pocket coils. These are short enough to be microcoils, but they are about the width of the base coils. This flatter profile enables the coils to stretch horizontally, which makes the layer even more flexible. A ¾" layer of Talalay latex covers these coils. The cover fabric of organic cotton is quilted to a mixture of wool and camel hair. Adding camel hair to the wool adds to the temperature control. Compressed wool is used as a flame barrier to meet federal standards. The Triple Coil Model is sold through several retail stores across the United States and two in Canada. It is covered by a 10-year prorated warranty.